This Saturday March the 2nd, get 20x the PC Optimum points at Shoppers Drug Mart Canada when you spend $50 or more on nearly anything in the store. You will also receive an additional 5,000 PC Optimum points when you pay with your PC Mastercard. If you use coupons with this transaction, you will probably want to spend $50 after coupons to ensure you get the 5,000 points for using your Mastercard. On Sunday, March the 2nd, if you spend $75 on nearly anything in the store, you will receive a bonus of a $20 Shoppers Drug Mart savings card. Unlike regular gift cards, these promotional cards do expire, so pay close attention to the date printed on it and ensure that you redeem it before then. Also keep in mind that you will not earn points on the portion of your transaction paid with the promotion card. 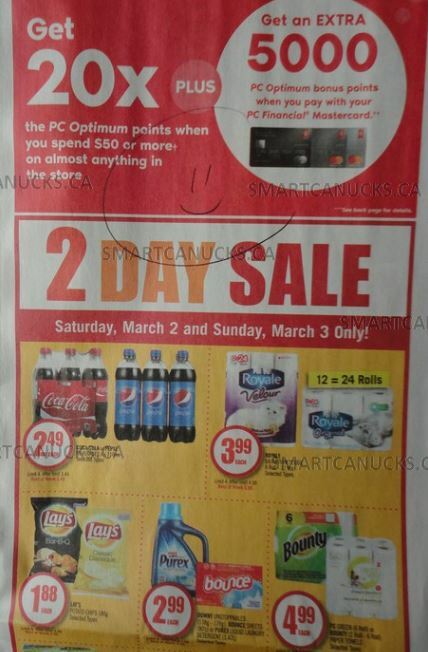 Click here to view the Shoppers Drug Mart Canada flyer valid March 2nd to 7th.